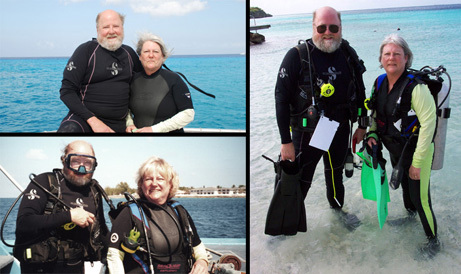 Ruth and I discovered scuba diving fairly late in life but have been making up for lost time! We've been diving for over twenty years now. We are avid Advanced and Dive Master open-water divers with experience in deep, wreck, drift, night, underwater naturalist, underwater navigation, recovery, rescue, signing-diver, emergency first responder, and nitrox diving! Recent trips to Bonne Terre Mine has allowed me to achieve the PADI Mine Diver certification. Belize - Aruba - Blue Grotto, Florida - Grenada - Carriacou - Bogue Banks, North Carolina - Bonne Terre Mine, Missouri - Bredina Springs, Illinois - Bull Shoals Lake, Arkansas - Cayman Islands British West Indies- Cerulean Springs, Kentucky - Cozumel, Mexico - Curacao, Dutch West Indies - Devil's Den, Florida - Flower Garden (Gulf of Mexico), Texas - Grand Turk Island - Haigh Quarry, Illinois - Homosassa River, Florida - King Springs, Florida - Lahina, Maui, Hawaii - Mermet Springs, Illinois - Norfork Lake, Arkansas - Panama City (Gulf of Mexico), Florida - Pennyroyal Quarry, Kentucky - Rainbow River, Florida - Roatan, Honduras - SS Xicotencatl Wreck, Mexico - Stetson Banks (Gulf), Texas - USS Vandenburg Wreck, Florida - Vortex Springs, Florida.. Assembled here are a few selected video features I have composed from many of our dive excursions. We hope you enjoy watching them as much as we enjoyed the dives! images are mostly scanned photographs.